Some days ago, my friend Bruno tweeted a very interesting article about a proposal by the American think tank Third Way to enclose a kind of tax receipt detailing the taxpayer the use the administration had given to her funds (see the original receipt in the previous link). Therefore, this post is not an original idea but the application of that proposal to the case of Spain and me as the taxpayer. To build the “tax receipt” I used 2009 figures. 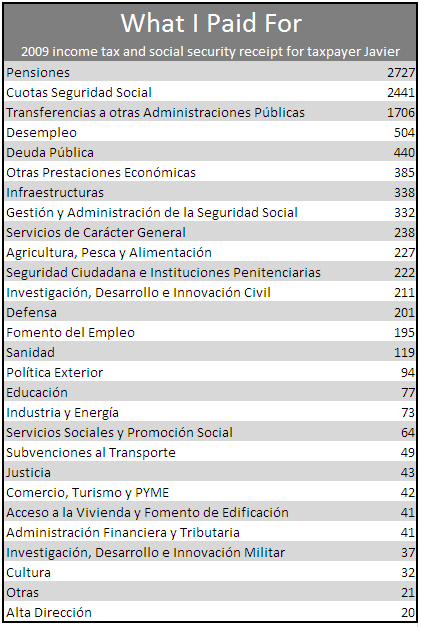 The source I used for a detailed breakdown of Spain’s budget is the same one than a I used in a previous post: a good infographic from lainformacion.com. My 2009 income tax and social security receipt. I paid 119 € for health… I consider that cheap; in 2009 I actually went to the doctor couple of times and got some vaccines partially subsidized. I paid 201 € in defence and 37 € in defence-related R&D… taking into account that my salary partially comes from there, I wouldn’t mind more of it to be spent there. One final remark: the government when decreased functionaries salaries in spring was looking with those measures to cut ~15.000 million € in about 1.5 years… this would mean about 220 € per inhabitant / year… where would you take those 220 € from my 2009 bill? Good job, man. I am sure you, and any other who reads this, will see taxes and national budgets more personal matters. If you pass me the spreadsheet, I can try to make a Google Doc to generate the table for any tax return, so people can feel even more engaged with their national budget. I agree with Bruno, Javi, maybe you could put this also in Spanish on the blog? It seems funny to me that you pay 77 euros a year for education, yet 94 euros to have the king visit Malta (officially!) for the first time ;-). I recently heard from a friend that in Holland we pay 70 euros per person in tax a year to keep up maintenance of the dikes and other water management. Now, that’s cheap!